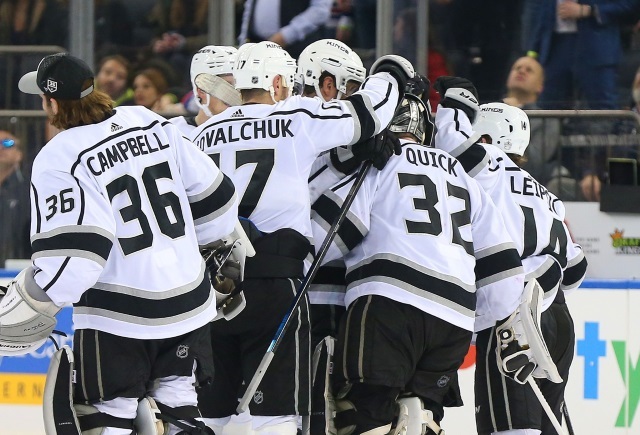 The Fourth Period: The Los Angeles Kings have made several of their players available. Forward Ilya Kovalchuk has a full no-movement clause but is generating some interest. He is apparently willing to waive it for the right contender, and the Kings may be okay with retaining some salary. The 35-year old Kovalchuk has two years left at a $6.25 million salary cap hit. The New York Islanders, Dallas Stars, Boston Bruins and San Jose Shark have shown interest in the past. It’s not known what the Kings would like in return. John Hoven of Mayors Manor: The LA Kings won’t be trading Anze Kopitar, Drew Doughty and Dustin Brown, and unlikely to move Kyle Clifford. Forward Jeff Carter and defenseman Alec Martinez are available. The Nashville Predators and Boston Bruins could have interest in Carter. The Tampa Bay Lightning have been interested in Martinez earlier this season. The Kings had multiple scouts watching the Washington Capitals this past weekend. For Martinez, they expect to get a second round pick and a third or equivalent prospect. If the Columbus Blue Jackets trade Sergei Bobrovsky to the Florida Panthers, you can expect them to go after Jonathan Quick right away. It is believed that trade talks have already taken place and there is interest. If the Kings trade Ilya Kovalchuk they could retain around $1.5 to $2 million in cap space. Trading Kovalchuk may hinder their ability to sign Kovalchuk’s former St. Petersburgh (KHL) teammate and Kings prospect Nikolai Prokhorkin. Maybe less than 20 percent chance that they trade Tyler Toffoli. It’s unlikely the Kings would trade Derek Forbort. Alex Iafallo, Adrian Kempe, Matt Luff and Austin Wagner are likely safe as well. Carl Hagelin and Nate Thompson will likely be traded. John Hoven of Mayors Manor: The Kings would need to get a first-round pick in any deal for Jonathan Quick. A Quick trade may not come until the offseason. The Fourth Period: The Nashville Predators and Boston Bruins have shown interest in Jeff Carter. The Tampa Bay Lightning and Edmonton Oilers have been linked to defenseman Alec Martinez. The Montreal Canadiens and Carolina Hurricanes are believed to be watching Tyler Toffoli.